Want to know how you will be affected by new EASA mandated medical requirements, or how to respond if intercepted by a Typhoon in the Olympic airspace restricted zone? 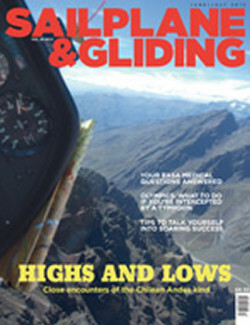 See the June-July issue of S&G, where you can also read about how being low was one of the highs of flying over the Chilean Andes. Dr Sally Evans, the chief medical officer for the UK CAA, talks to S&G about how glider pilots will be affected by EASA mandated medical requirements and explains that we will have almost three years – until April 2015 – to change over to the new requirements. In the meantime, the BGA medical requirements will continue to be in place. Dr Evans played a helpful role during the development of the ‘acceptable means of compliance’ to minimise the potentially negative impact of the EASA GP medical requirements. Of more immediate attention is the necessity to be fully aware of the Olympic airspace restricted zone. Gordon MacDonald explains what will happen to you (and your club) if you infringe Olympic airspace and how you must respond if intercepted by a Typhoon or helicopter, to avoid the risk of being shot down by on-board snipers. Infringements resulting in military interceptions, with knock-on disruption to major airports, carry a real risk that concessions agreed to date will be rescinded and action taken to restrict access to airspace even further. 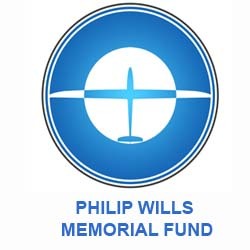 Away from the UK, Olly Peters enjoyed a memorable Royal Air Force gliding exchange to Chile earlier this year. One of the highs for Olly of his 43 hours flying over the spectacular scenery of the Chilean Andes was one particular flight that was very different to the rest. Always low – never above 8,000ft, but with the ground not much below – and with no oxygen needed, it was a completely different concept to cruising around the second system deep inside the Andes. Ensuring there was always a safe escape route and, more importantly the speed to enable Olly and Chilean co-pilot Arturo Diez to fly it, was challenging. Few other sports demand such lengthy and uninterrupted mental effort as gliding. Whether you are flying cross-country for fun, or competing in a top-level championship, it is important to always be one step ahead mentally. Bernard Eckey, author of Advanced Soaring Made Easy, explains why sports psychology is just as important as practical skills – especially in difficult or stressful situations – and how you can learn to master your thought processes, emotions and feelings. 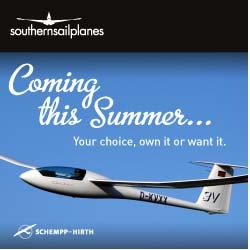 Also in this issue: S&G reports on gliding interests at AERO 2012, Friedrichshafen. Andy Davis reports on the development of Jonker Sailplanes’ JS1 Revelation jet sustainer, the JS1-TJ, while Afandi Darlington sees how this new generation of turbojets compares with the standard glider turbo powerplant, the Solo 2350. Alan Lapworth continues his series of articles on waves in the atmosphere with a look at travelling waves. Kate Byrne recounts the tale of her first landout of the year – in a field belonging to a Scottish castle. Sarah Kelman looks at how to avoid an airprox by minimising flight through the busiest spots and by pragmatic use of the radio. Ab-initio Malcolm Taylor discusses the process of learning with BGA Training Standards Manager Mike Fox. Three times world gliding champion George Lee reflects on his exploits in gliding, competition flying and his love for silent flight. David Clark questions the confusing use of feet, metres and nautical miles in an age of GPS and the atomic clock. Max Kirschner asks if the UK could learn a few things from competition flying in Australia. BGA Chairman Pete Harvey comments on a review of the BGA media and online strategy. Two books – Angle of Attack and The Cloud Collector’s Handbook – are reviewed. BGA Development Officer Alison Randle looks at why gliding should be more accessible to all. Mike Davis describes how vintage gliding has brought a whole spectrum of new skills to members of the Kent Vintage Glider Group. One of the BGA’s youngsters, Charlie Jessop, talks about the challenges facing juniors and how he set up a university gliding club. We’ve more truly stunning images in the Gallery pages. And last, but not least, there’s the BGA club annual statistics. What will happen if you infringe the Olympic airspace restricted zone?